In Year 1 we looked at the values of Mutual Respect and Tolerance. We thought about what Mutual Respect is after reading the story Giraffes Can’t Dance and then we wrote about our understanding of respect. We also thought about similarities and differences between ourselves and people around the world. We drew two different halves of a face to represent two different cultures and wrote similarities between our lives and the life of a little boy in another part of the world. In Foundation Stage we read the book 'But why Can't I?' This book is about a boy called George who did not understand why rules are important. In class we talked to the children about rules in school and why we have them. The children wrote their own classroom rules. 4DD read a story called 'The Election' by Eleanor Levenson and Marek Jagucki and then discussed what 'Democracy' meant and what it meant to live in a Democratic Society. Year 4 CS/JJ Our class made posters after researching aspects of British Values. Year 6 read the book 'The Island' and wrote a persuasive speech to encourage the islanders to look after the refugee, who washed up on their shores. Click on the photos to read Georgia and Max's amazing efforts. In Year 3 we looked at Mutual Respect and Tolerance. We looked at how both values interlinked and how it is important we treat everyone equally. We made posters to demonstrate our understanding. Also, see our video on 'Respect' and 'Tolerance' below. In Year 2 we read the story 'Dogs don't do Ballet'. This story focused on the British value of individual liberty. We talked a lot about how we can achieve anything we set our minds to with perseverance. Year 5 did a fantastic job with their work on British Values during British Values week! 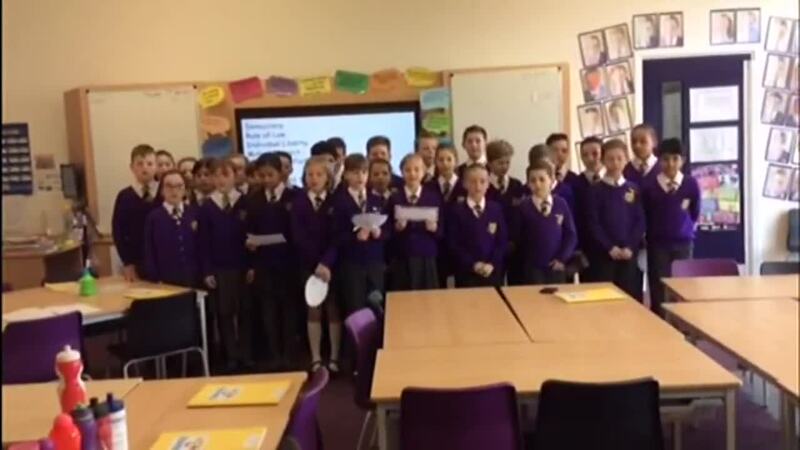 Here are some photos of 5JG with their work and a video by Miss Begum's class performing a catchy song to remember what the British Values are! Log into Seesaw to check out the videos!